objective: the name of the function to minimize, objective(p). This can be a string or a function handle, or an iFunc model. guess: the starting parameter set that the objective depends on (this is e.g. a vector of numerical values). The optimizer, here 'fmin', can be replaced with any optimizer in the list below. The objective function should use the vector of parameters in order to compute a value (the criterion) to minimize. This value is usually a positive scalar that should tend towards zero. When the objective returns a vector, the sum of its elements is used as criterion, except for the Levenberg-Marquardt for which it is used as is. options.MaxFunEvals: Maximum number of function evaluations allowed, sometimes referred as the 'cost' or 'budget'. options.TolFun: Termination tolerance on the function value (absolute value or change). Use 'x%' to specify a relative function change, e.g. '1%'. options.TolX: Termination tolerance on parameter change. Use 'x%' to specify a relative parameter change, e.g. '0.1%'. options.OutputFcn: Name of an output function. When set, it is called at each iteration step. You may use 'fminplot', which is provided in Optimizers. Refer to the Fit page for more information about fminplot. A simpler/faster alternative is the 'fminstop' option. In all supplied Optimizers optimizers cases, the optimizer can handle constraints (or more specifically restraints, that is constraints on parameters values), specified as a 4th input argument. These are often lower and upper bounds. Refer to the documentation of each minimizer for more information, and the documentation about fitting models onto data sets. The number of optimization parameters is not restricted. All of these optimizers follow the same syntax, just as the default Matlab fminsearch optimizer (which is based upon the simplex method). where the options and output arguments are structures. All of these methods support constraints on parameters during the optimization process (see below). The iData and iFunc fits method are wrappers to any of the Optimizers optimizers, with a specified fit criterion. The objective function should be a function of a single parameter p.
>> p.par1=4; p.par2=5; 		% optimize two parameters with names par1 and par2. >> fminsce(objective, p)	% The result is also returned as a structure. An optimization procedure is associated to a criterion minimization. 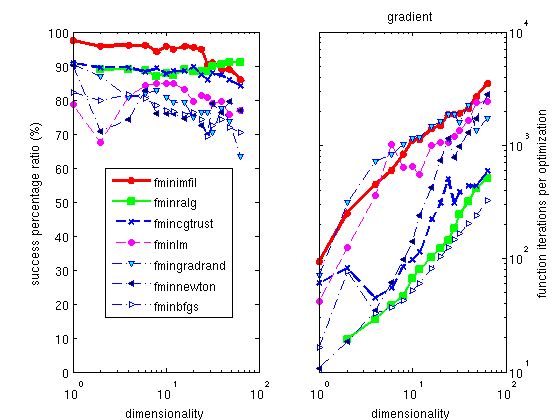 Once a local/global minimum has been found, the best found model parameters are returned. However, any optimization result is located in an uncertainty volume in which a small change of the parameters does not produce a change of the criterion larger than the tolerance used during the optimization procedure (options.TolX and options.TolFun). This value is computed and stored in output.parsHessianUncertainty, and the corresponding error matrix (covariance) is stored in output.parsHessianCovariance (its diagonal square root is the projected parameter uncertainty). This step is only performed when the Hessian matrix requires less than about a minute to compute. Additionally, the output.parsHessianCorrelationindicates the cross-correlations between parameters (off-diagonal values larger that 0.7 indicate cross-correlated parameters). The Hessian statistics are explicitly computed when options.Diagnostics='on', or when the time required for computation does not exceed about a minute. The parameter uncertainties are displayed when options.Display is set to 'final' or 'iter'. The fastest methods are the Shor R-algoritm (fminralg, does not work for one parameter) and the Powell method is also a good choice (fminpowell). The Levenberg-Marquardt (fminlm) is very effective when the criterion is a vector. The genetic algorithm is the slowest of all methods. The most efficient methods are the Swarm (fminpso) and the Powell method with local Coggins line search (fmipowell). The Hooke's (fminhooke) method is a good alternative, but it is slower than the Powell. We also recommend the Markov Chain Monte Carlo (fminmarkov) which is very robust, but slow. The Table 1a and Figure 1a present a selection of the 'best' optimization methods for continuous functions (non noisy problems). For each of them, we indicate the typical success ratio, and solving time (mean number of function calls required). Figure 1a: Best optimizers for continuous (non-noisy) problems, as a function of the number of free parameters. The overall success ratio, as well as the mean execution time is shown. The Powell optimizer is both excellent in success ratio and execution time. Table 1a: A selection among the most successful and fast optimization methods, for continuous (non-noisy) problems. The fastest methods are the Evolution Strategy with Covariance Matrix Adaptation (fmincmaes) and the Particle Swarm Optimization (fminpso). The most successful methods are the Swarm (fminpso), the Shuffled Complex Evolution (fminsce) and the simplex/simulated annealing (fmisimpsa). 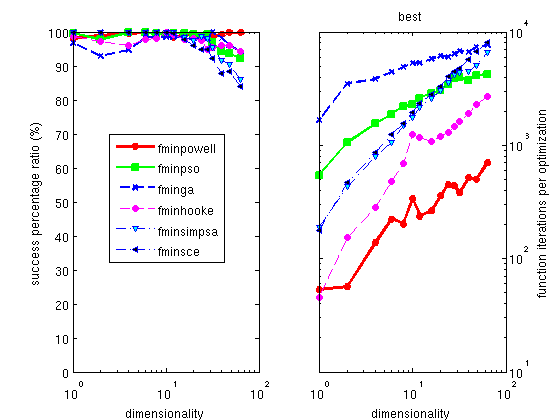 For large dimensionalities (many parameters), the Evolution Strategy with Covariance Matrix Adaptation (fmincmaes) proves very successful, as well as the Shuffled Complex Evolution (fminsce). We also recommend the Markov Chain Monte Carlo (fminmarkov) which is very robust, but slow. 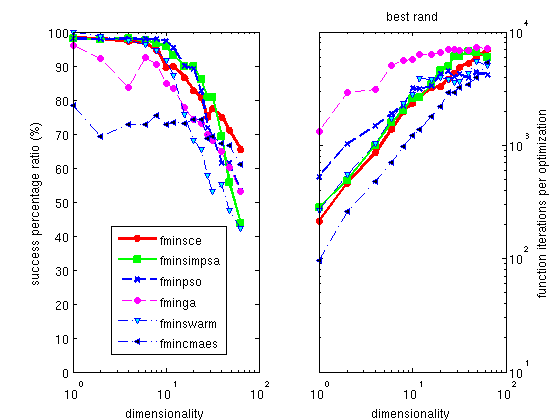 The Table 1b and Figure 1b present a selection of the 'best' optimization methods for noisy functions. For each of them, we indicate the typical success ratio, and solving time. Figure 1b: Best optimizers for noisy problems, as a function of the number of free parameters. The overall success ratio, as well as the mean execution time is shown. The Particle Swarm optimizer is good in success ratio, with fair execution time. Table 1b: A selection among the most efficient and fast optimization methods, for noisy problems. We have performed extended tests of all the optimizers that are given in the Optimizers sub-library. For each optimizer, we have minimized a set of functions, which include sharp, broad, with local minima, etc... The function set has also been used when adding a Gaussian noise of 10%. Each of the 52 model functions [16,17] to minimize has been solved with up to d=64 parameters. Each of the 22 optimizers has solved all the functions, with d=1-64 parameters. Each of these tests has been repeated 5-10 times with a random set of starting parameters. This makes about 80000 optimizations... We then present a list of these optimizers, with their mean solving success ratio for both continuous and noisy problems. This provides a quantitative measurement of optimizers, which helps in choosing good methods, and put aside bad ones. More detailed results are shown in the table and plots below. Generally, solving noisy problems requires longer optimization search time than for continuous problems, and the optimizers that perform best in this case are those that intrinsically make use of random numbers. Table 2: Optimization methods in iFit/Optimizers, with mean success ratio in the dimensionality range d=1-64. Bold values indicate recommended algorithms. 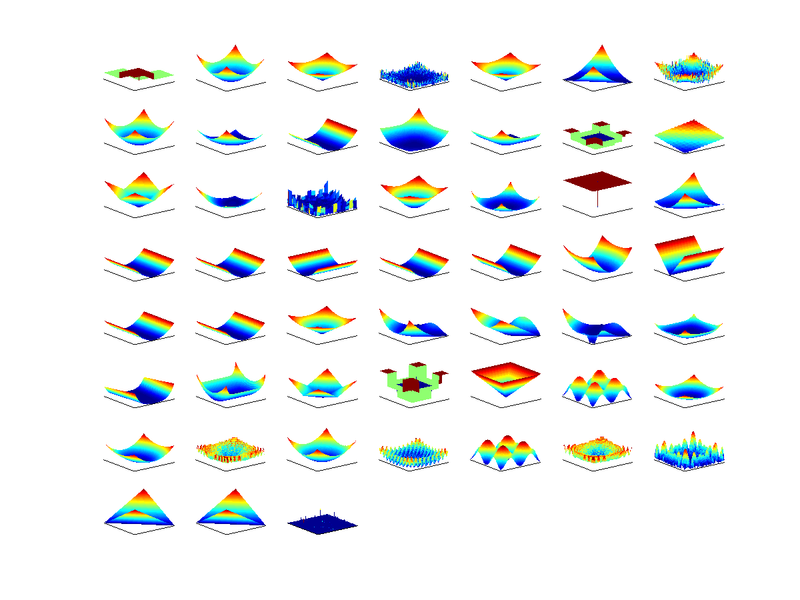 Default parameters from Matlab implementations are used, and MaxFun=2500*d, MaxIter=250*d, TolFun=1e-4. Best optimizers are highlighted in green. Methods to avoid are in red. Most of the optimizers given with Optimizers have been gathered from the open-source community. In a few cases, the same mathematical method has been implemented as a number of equivalent methods (swarm, simplex), but with different overall success ratios. This means that there is no unique way to code an optimization algorithm. We do not provide any guaranty regarding the effectiveness of the optimizers, but we may statistically compare them. 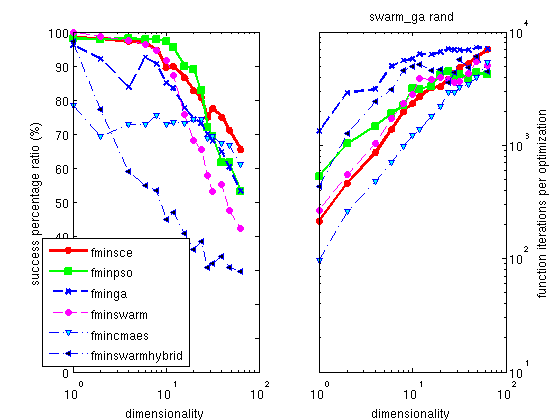 Figure 2: Mean success ratio and solving time for swarm and genetic algorithm methods, as a function of the number of parameters to optimize. The swarm methods (aka particle swarm optimizer) provide a very good success ratio. Among these, the particle swarm optimizer fminpso is among the best. The covariance matrix adaptation evolution strategy fmincmaes has a lower success ratio but is much faster. Figure 3: Mean success ratio and solving time for gradient methods, as a function of the number of parameters to optimize. The gradient methods (derived from the Newton's method) are often considered to be the fastest. The well known Marquardt-Levenberg is an implementation of an adaptive Newton's method with a least square criterion (see below). This is true - they are fast for a reduced number of model parameters. However they often fail, as the method easily gets trapped into local minima. They are notoriously inefficient with noisy data. Note: The Maquardt-Levenberg method fminlm is designed for objective functions/criteria as vectors. Its success ratio is then highly improved. However, its memory requirements and execution time for large dimensionalities are significantly higher than other methods. Figure 4: Mean success ratio and solving time for other non-conventional methods, as a function of the number of parameters to optimize. The Hooke optimizer fminhooke is one of the most efficient methods for all continuous problem, and among the fastest solving time. The Powell optimizer fminpowell is a well known, simple and efficient method, which partly works on noisy problems. Its version with the Coggins line search is the fastest of all the optimizers proposed here. The use of the Golden rule line search slightly improves its success ratio, but dramatically increases the execution time. The default optimizer shipped with Matlab is the fminsearch one, which is a pure simplex implementation. We do not recommend this method, as all others are better in success ratio, some being as fast. A better alternative is a mix of a simplex with a simulated annealing process, implemented as fminsimpsa. The constraints vector should have the same length as the model parameter vector. The constraints vectors should have the same length as the model parameter vector, and NaN values can be used not to apply min/max constraints on specified parameters. Last, it is possible to restrict the change rate of parameters by assigning the constraints.steps field to a vector. Each non-zero value then specifies the absolute change that the corresponding parameter can vary between two optimizer iterations. NaN values can be used not to apply step constraints on specified parameter. the syntax for the optimization is e.g. that is additional arguments are specified as 5th, 6th... arguments. In this case, would you need to set optimizer configuration or restraints/constraints, we recommend to give 'options' and 'constraints' arguments 3-4th as structure, as explained above. If you wish to fit a Model onto a Data set, you need to define a metric to measure the difference between the two quantities. This is then called fitting, which is a minimisation of a criterion. A set of predefined criteria functions can be used for this purpose. This is what is done in the 'fits' methods of the iData and iFunc classes. 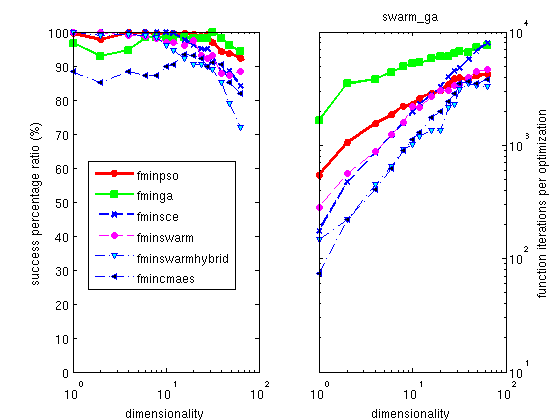 Simplex/simulated annealing fminsimpsa [SIMPSA by Donckels] Cardoso, Salcedo, Feyo de Azevedo and Bardosa, Comp. Chem Engng, 21 (1997) 1349; Kirkpatrick, J. Stat. Phys. 34 (1984) 975. Nelder-Mead simplex fminsearch(bnd) [fminsearch by Mathworks] Jeffrey C. Lagarias, James A. Reeds, Margaret H. Wright, Paul E. Wright, "Convergence Properties of the Nelder-Mead Simplex Method in Low Dimensions", SIAM Journal of Optimization, 9(1): p.112-147, 1998. Unconstrained Implicit filtering fminimfil [imfil by Kelley, 1998 version] C. T. Kelley, Iterative Methods for Optimization, no. 18 in Frontiers in Applied Mathematics, SIAM, Philadelphia, 1999. Steihaug Newton-CG-Trust region algorithm fmincgtrust [cgtrust from Kelley] Broyden, C. G., J. of the Inst of Math and Its Appl 1970, 6, 76-90; Fletcher, R., Computer Journal 1970, 13, 317-322; Goldfarb, D., Mathematics of Computation 1970, 24, 23-26; Shanno, D. F.,Mathematics of Computation 1970, 24, 647-656; C. T. Kelley, 1998, Iterative Methods for Optimization no. 18 in Frontiers in Applied Mathematics, SIAM, Philadelphia, 1999. 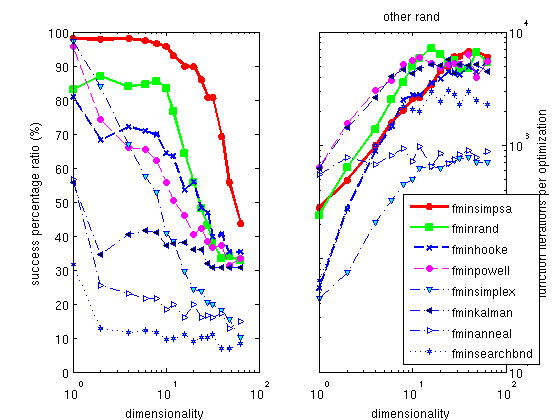 Evolution Strategy with Covariance Matrix Adaption fmincmaes [cmaes by Hansen] Hansen, N. and S. Kern (2004). Evaluating the CMA Evolution Strategy on Multimodal Test Functions. 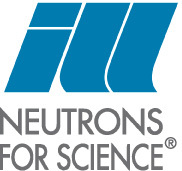 Eighth International Conference on Parallel Problem Solving from Nature PPSN VIII, Proceedings, pp. 282-291, Springer. ; Hansen, N. and A. Ostermeier (2001). Completely Derandomized Self-Adaptation in Evolution Strategies. Evolutionary Computation, 9(2), pp. 159-195.; Hansen, N., S.D. Mueller and P. Koumoutsakos (2003). Reducing the Time Complexity of the Derandomized Evolution Strategy with Covariance Matrix Adaptation (CMA-ES). Evolutionary Computation, 11(1). 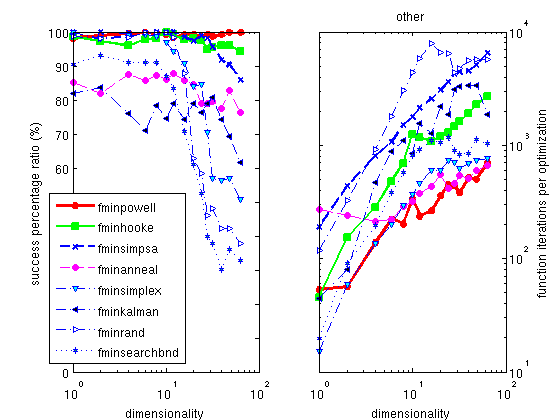 Shuffled complex evolution fminsce [SCE by Donckels] Q. Y. Duan et al, J. of Opt. Th. and Appl. 76 (1993) 501. Hooke-Jeeves direct search fminhooke [hooke by Kelley] Arthur F. Kaupe Jr., Communications of the ACM, Vol 6. (1963) 313; R. Hooke and T. A. Jeeves, Journal of the ACM, Vol. 8, April 1961, pp. 212 ; C. T. Kelley, 1998, Iterative Methods for Optimization, no. 18 in Frontiers in Applied Mathematics, SIAM, Philadelphia, 1999. 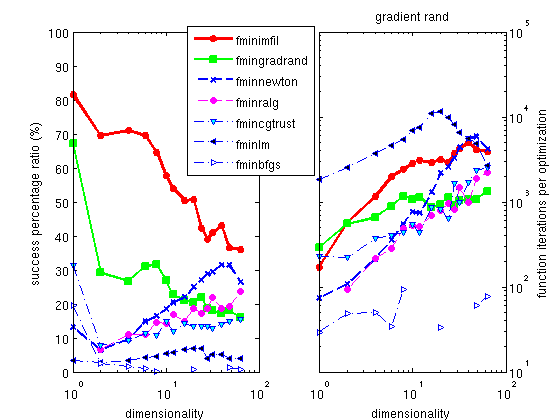 Adaptive random search fminrand by A.R. Secchi 2001 A.R. Secchi and C.A. Perlingeiro, "Busca Aleatoria Adaptativa", in Proc. of XII Congresso Nacional de Matematica Aplicada e Computacional, Sao Jose do Rio Preto, SP, pp. 49-52 (1989).